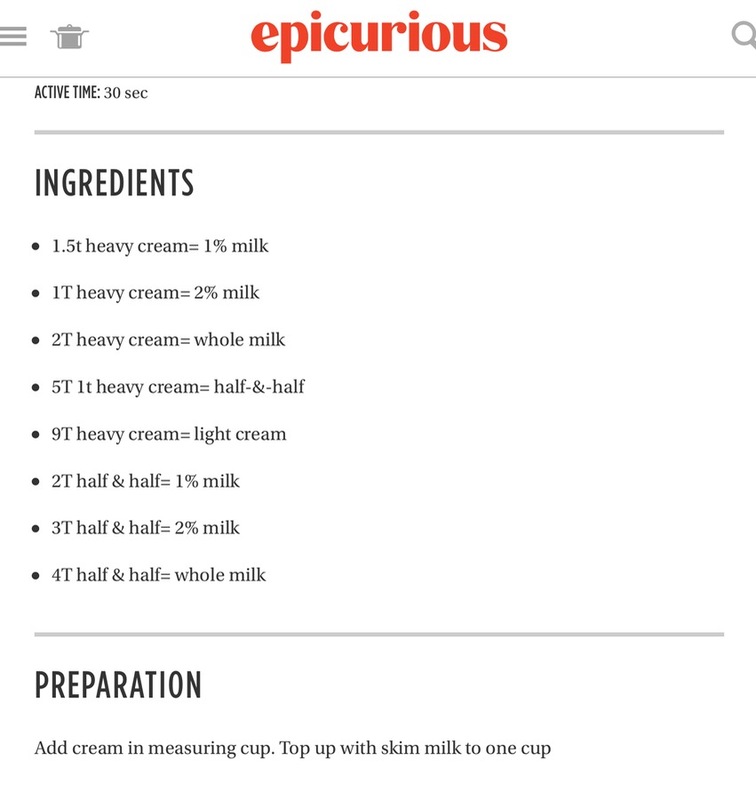 This is from Epicurious, a favorite site. I needed this as I never have whole milk when I need it, but I always have skim milk and cream. 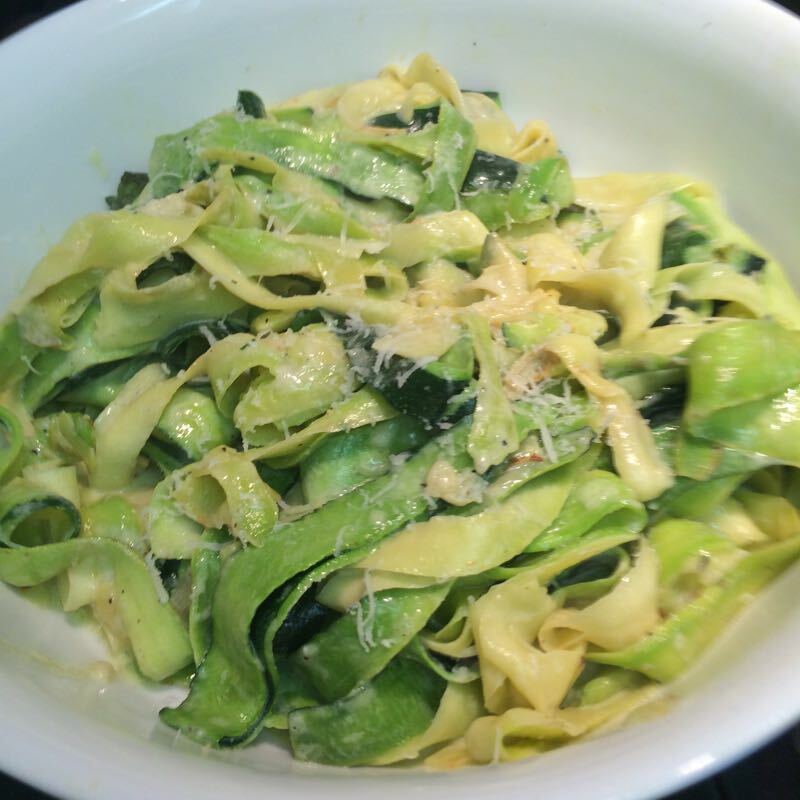 When you have lots of chard in your garden, or it’s on sale at the green grocer’s, it’s time to make this dish. 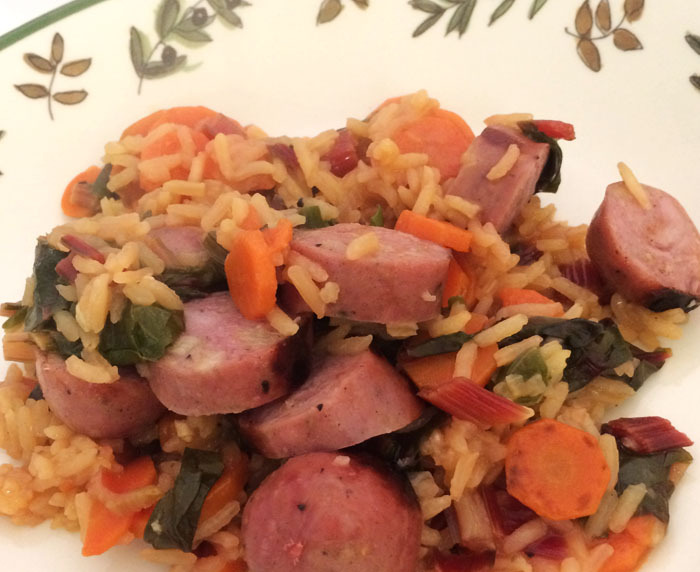 If you don’t add the brats and use water instead of the broth, it’s vegetarian, but we like to use Apple-Chicken sausage (we buy it at Costco) and add it to this dish. 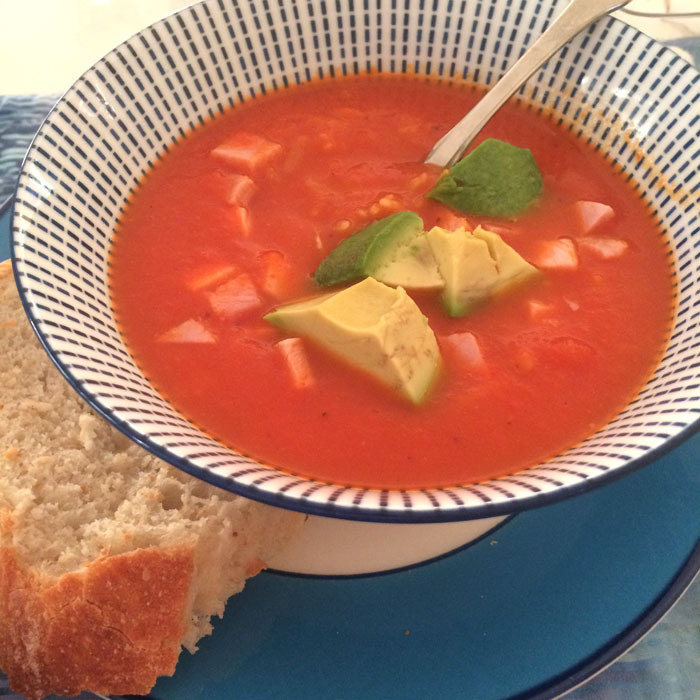 The original recipe came from Mark Bittman, but I’ve made some modifications. Cut the stems out of the chard leaves. Line up the stems (they look like pink celery) and slice them across the bunch, then cut the leaves into wide ribbons. Keep separate. 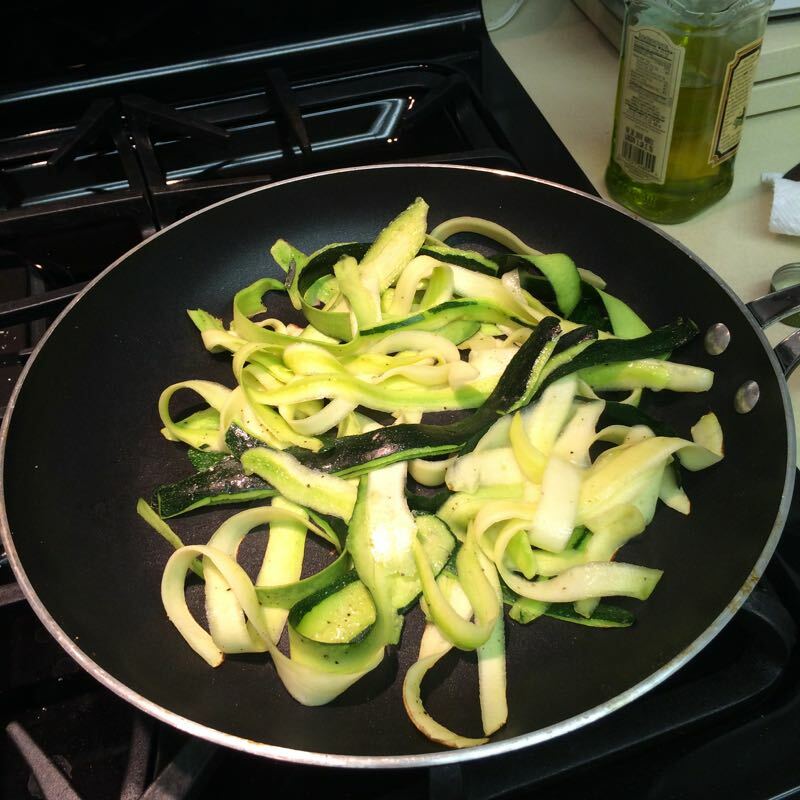 Put all but a tablespoon of the oil in a large skillet over medium heat. 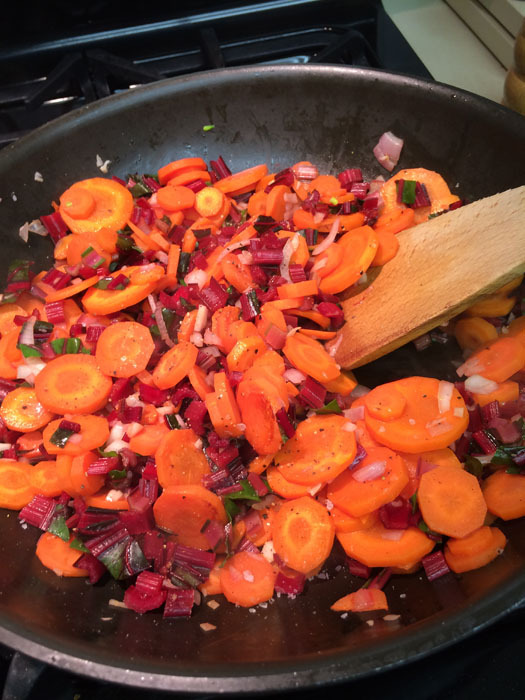 When hot, add the garlic, shallot, carrots and chopped chard stems, sprinkle with salt and pepper, and cook about 15 minutes, stirring occasionally. 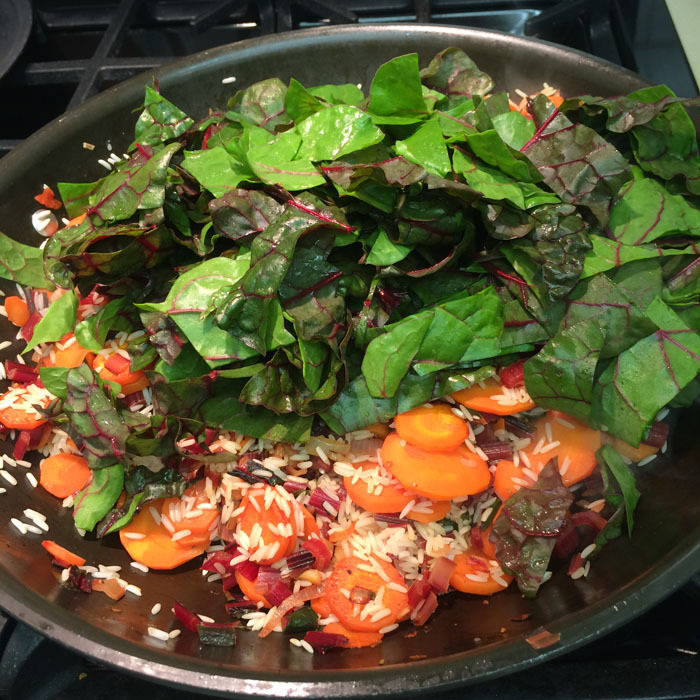 When chard/carrots are tender, add chard leaves, more salt and pepper, the rice, and chicken broth. Cover and simmer for about 20-30 minutes, or until water is absorbed (you may have to lower the heat). Add water if needed, until rice is cooked. The mixture will be moist, but not too soupy. 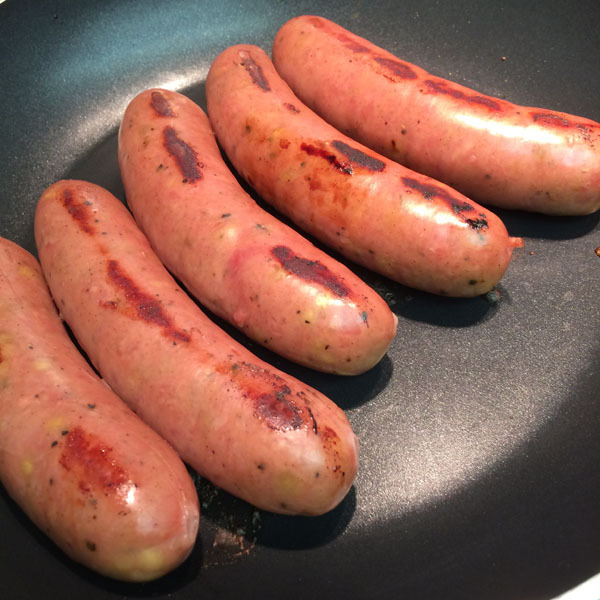 While those cook, place the sausage links into a non-stick pan, and over a low heat, cook until they are plump and slightly brown in places on the outside. 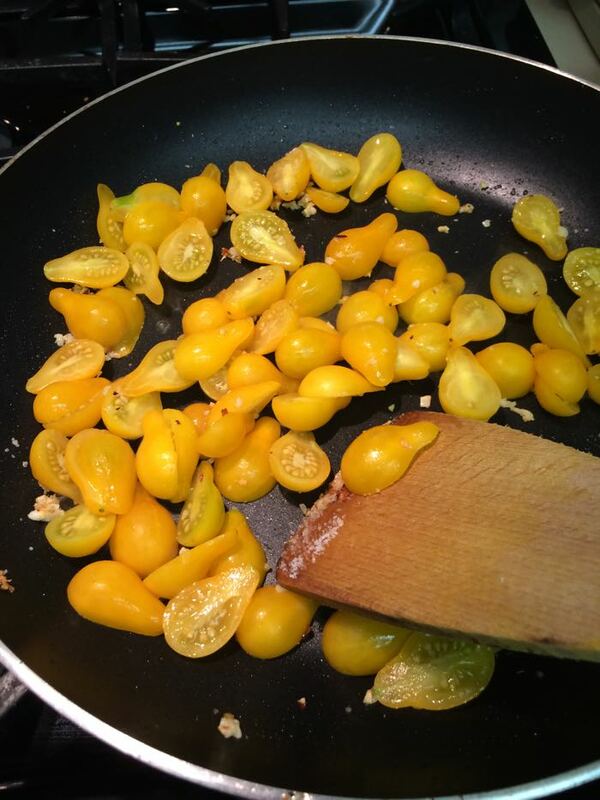 To finish the dish, add the juice of one lemon and a circle of olive oil, and if necessary, some more salt and pepper. 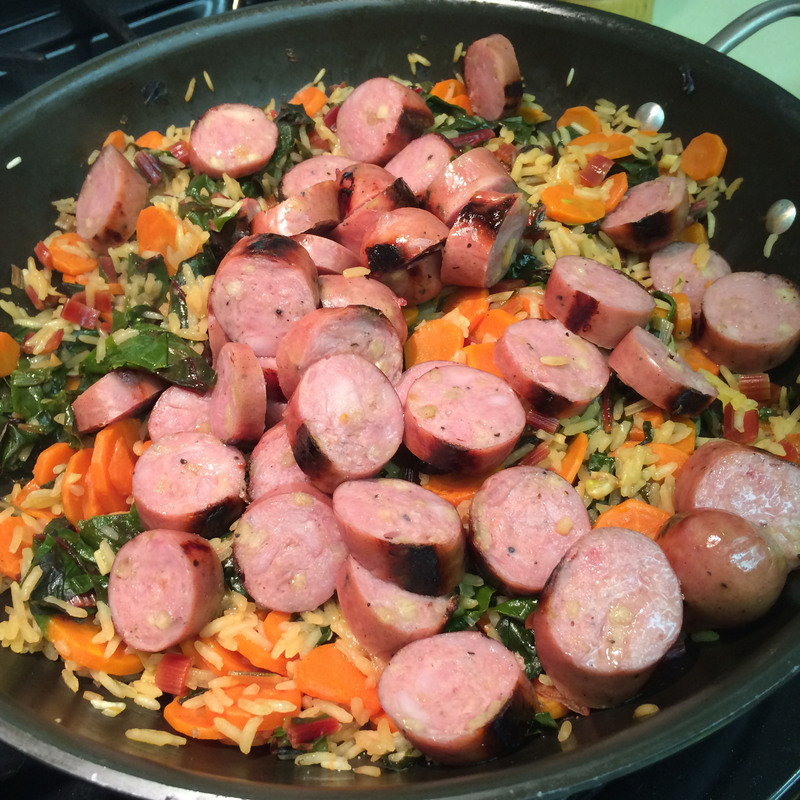 Slice the sausage/brats and pile on top of the rice/chard mixture. 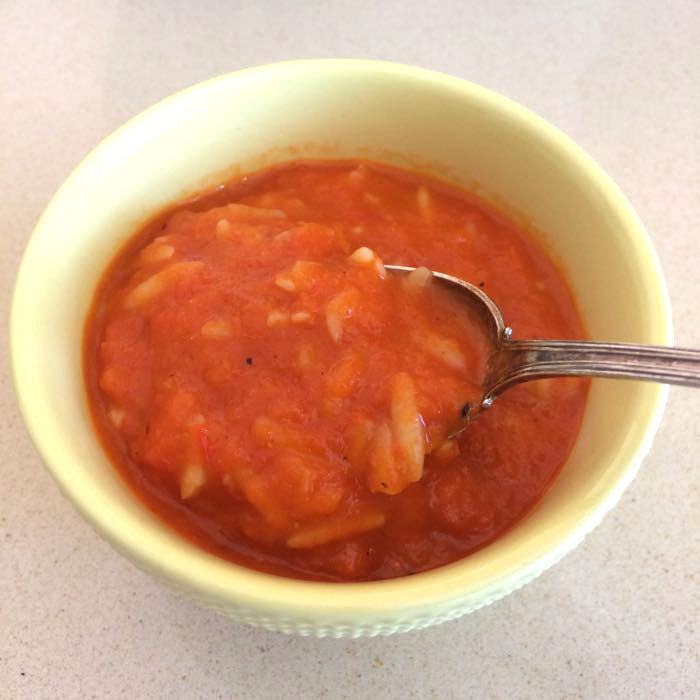 I first found this recipe in the New York Times; one version was by Julia Moskin and the other by Mark Bittman. I have made this several times and combined/changed things up to suit me. I like it because it begins with eggplant, and I always use the Japanese kind (so I can skip the salting step). 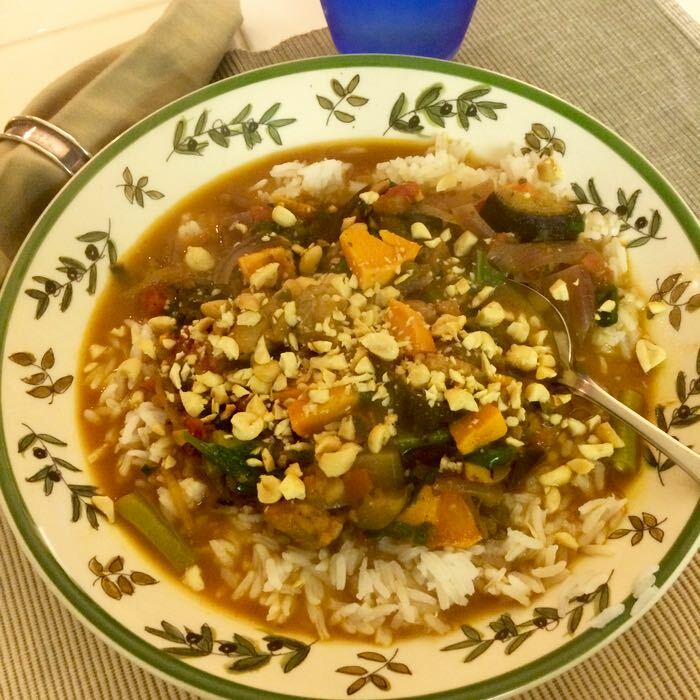 It’s a good stew to serve over some rice, on a day when you just need something flavorful and hearty for dinner. In a colander, toss eggplant with 1 teaspoon salt; set aside for 30 minutes [I skip this step if using Japanese eggplant]. Rinse, drain well and set aside. In a small bowl, combine cumin, coriander, turmeric and cayenne; set aside. In a large pot, heat 3 tablespoons oil over medium-high heat. Add shallots and fry, stirring often, until soft, and caramelized, about 5 minutes. Add chicken and continue cooking for another 3 or 4 minutes, until just starting to turn color. Using a slotted spoon, transfer shallots and chicken to a large bowl, leaving oil in pot (may need to add some more). Raise heat to nearly high and add eggplant. Cook, stirring often, until lightly browned and just tender, about 10 minutes. Transfer to bowl with shallots/chicken. Add remaining 1 tablespoon oil to pot and heat over medium-high heat. Add ginger and jalapeño and cook, stirring for 30 seconds. Add spices and cook, stirring, 30 seconds more. Add onion and cook, stirring to scrape up any browned bits, until softened and translucent, about 5 minutes. Add tomato paste and cook, stirring, 1 minute. 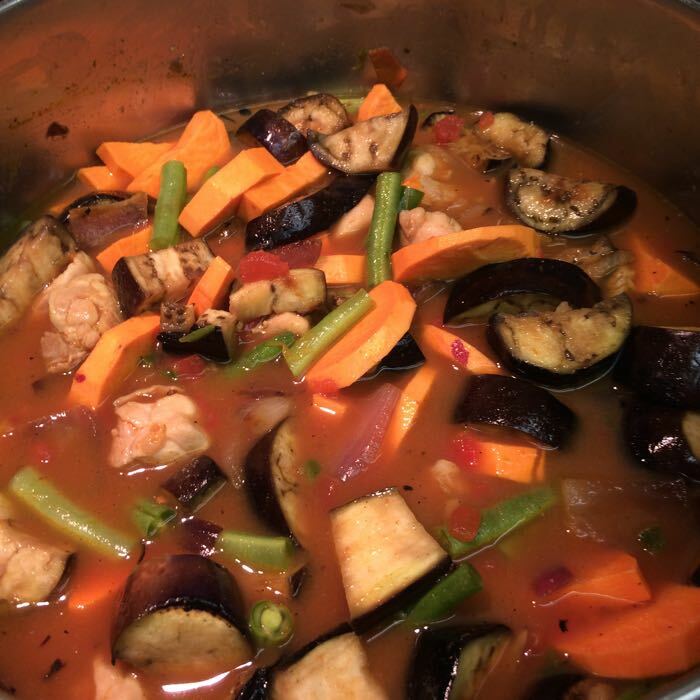 Add diced tomatoes, stock or water, eggplant, chicken, shallots and a sprinkling of salt. Bring to a boil and cook 5 minutes. Place peanut butter in a medium bowl, add one or two ladlefuls of hot soup, and stir until emulsified, then pour mixture back into soup. 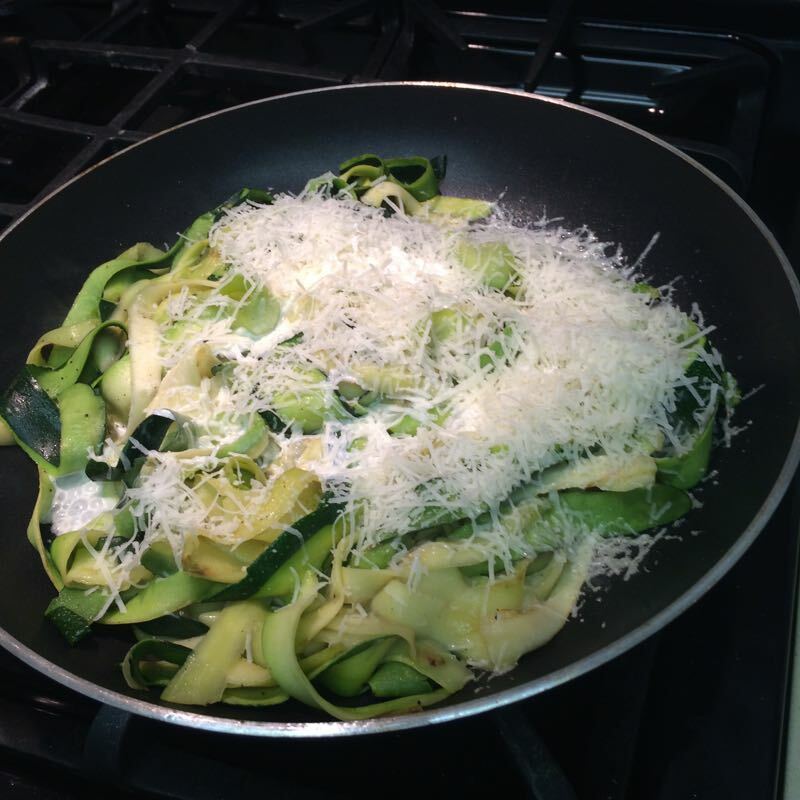 Reduce heat to a simmer, add zucchini, cover and cook 10 to 15 minutes, until vegetables are tender and chicken is done. 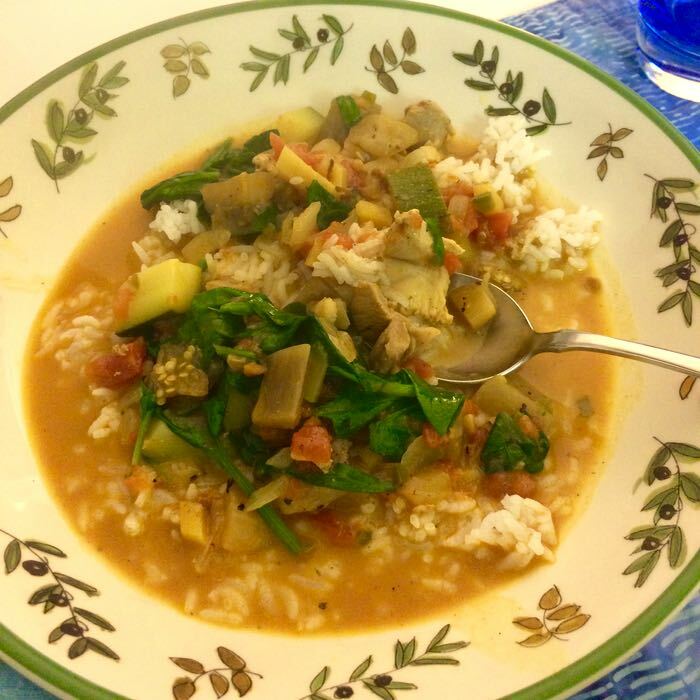 Turn off heat and stir in lemon juice, chopped cilantro, greens; stir until greens are wilted. 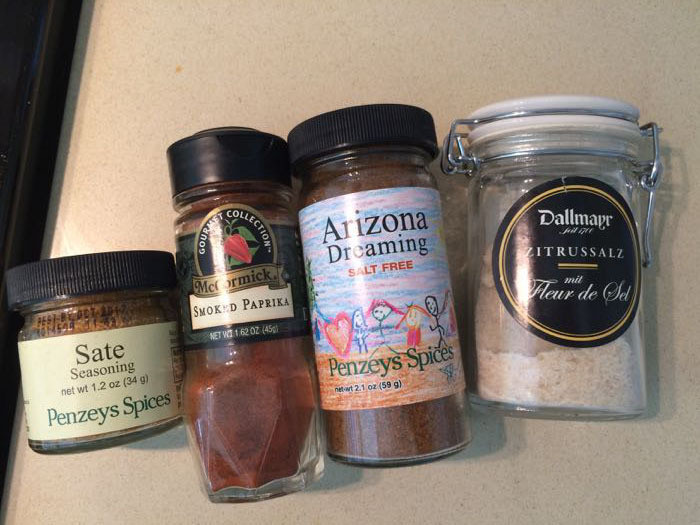 Let cool slightly and taste; add salt if necessary. Serve in bowls with rice, garnished with cilantro leaves and chopped peanuts, if desired. Note: Can omit chicken and add 1 (15 oz.) 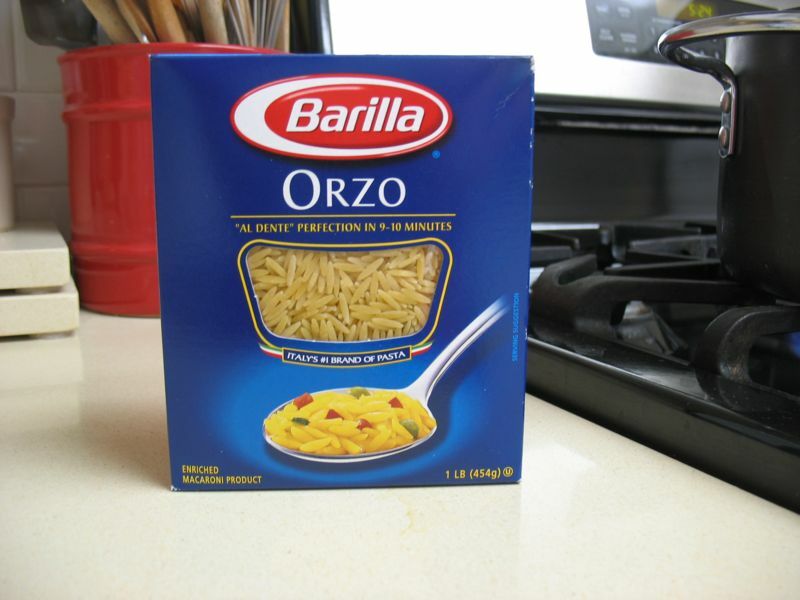 can garbanzo beans, if desired. 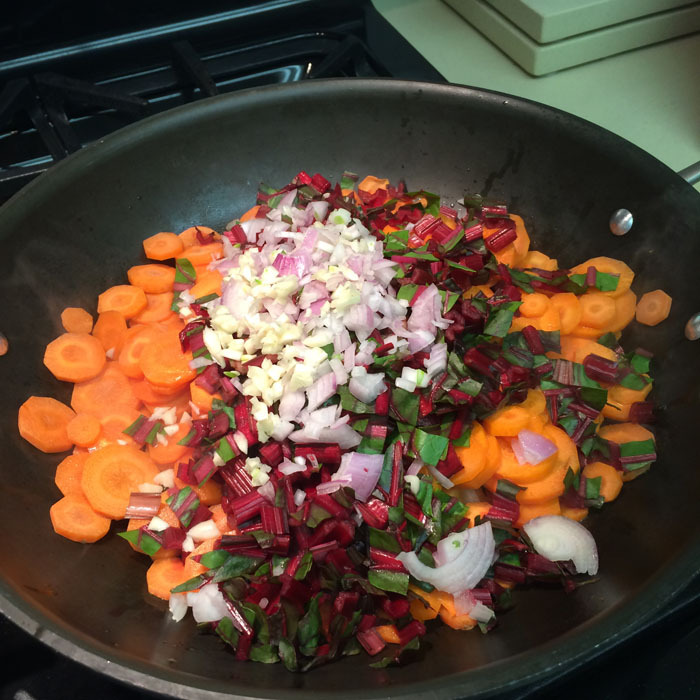 Can also add 1-2 thickly sliced sweet potato (as shown in the image above). 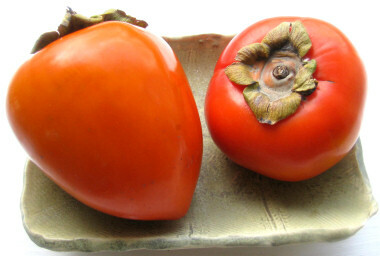 Fuyu persimmons are short and round, shaped just like a large tomato. They can be eaten raw and somewhat firm, without having a bitter, astringent taste. The Hachiya variety are larger, and teardrop shaped. 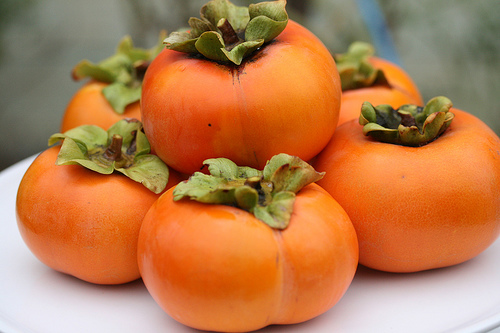 Hachiya persimmons need to ripen until they are very soft. They contain a lot of tannins when they are immature, which make them taste very astringent as well as cause severe stomach problems if a person actually manages to eat one. As the fruit ripens the tannin level decreases, until the taste becomes very mild. That’s why the hachiyas (shown above, with a pointy end) make you pucker up when they are unripe! Some say to cook with the hichiya and eat the fuyus in salads, or raw, but one cook found that Fuyus work fine in making her Persimmon Bread. When I made my bread, I waited until my hachiyas were this soft–or as someone said, like pushing in on a water ballon! 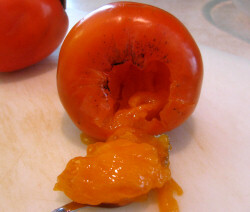 And I didn’t peel them, throwing the cored persimmon whole into my food processor with the ripe pears. If one hachiya is not as ripe as the other, you can cheat by micowaving it until it is soft. Alternatively, you can core them, then scoop out the jelly-like flesh. When I made my Pear-Persimmon bread, I simply cored them, then whirred the persimmon — skin and all — in the processor. We sometimes refer to them as “persey-mons:” once when we were staying in Bologna, I asked the hotel breakfast lady what kind of tree was just outside the breakfast room. “Persey-mon” was her reply, and so it stuck. One way to serve the Fuyu persimmons raw is to core and peel them, then slice them across the width. Layer them into a shallow serving bowl. Whisk together some white vinegar with some honey, about 2 Tablespoons of each, or until the tart-sweet taste is balanced. Test and add more honey to taste, if needed. 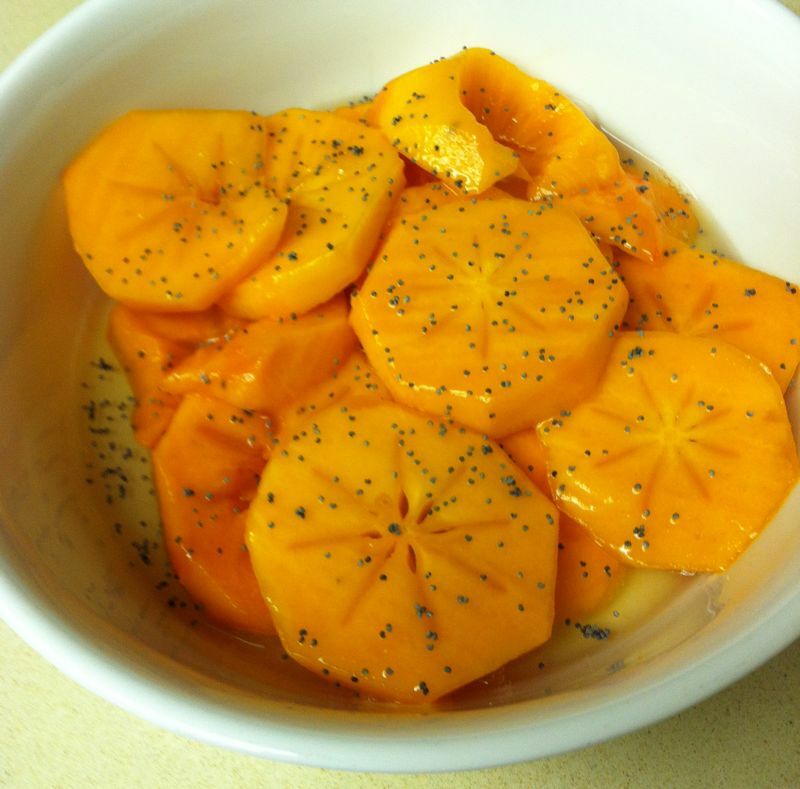 Pour this over the persimmons, then sprinkle with poppy seed. This is an elegant and easy side dish. 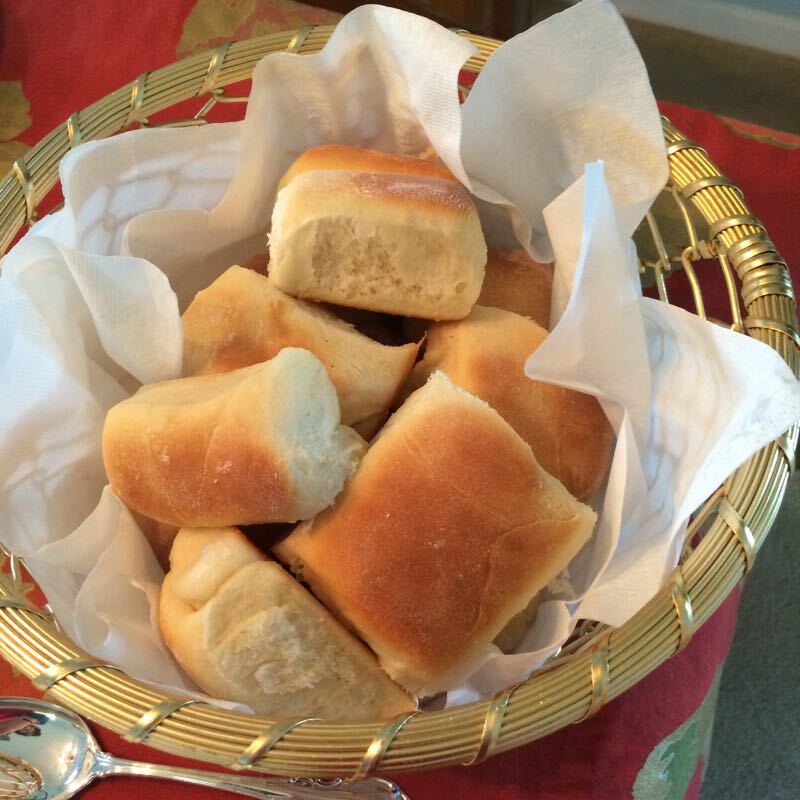 These are a basic roll recipe, without too much egg, so they are light, white and fluffy and taste very good. I made them last year as well as this year, and we loved them both times. This is from the Fleischman’s Bake It Easy Yeast cookbook, a staple in my house. Although it was published in 1973, and retails on Amazon for $196.00 (gotta love those bots), this recipe can also be found on Breadworld by Fleischman, which has many of the recipes I love. 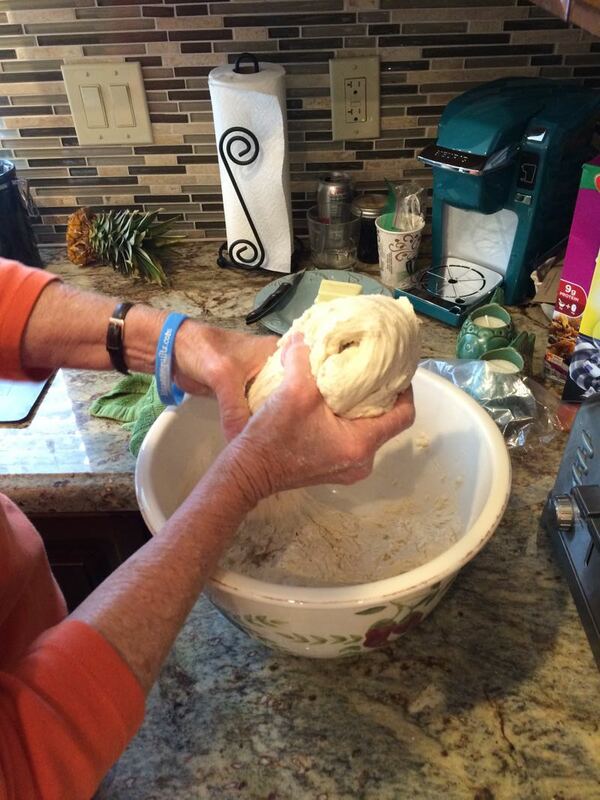 Divide dough in half; roll each half to a 12-inch square, about 1/4-inch thick. Cut each into 6 (12 x 2-inch) strips. Cut each strip into 3 (4 x 2-inch) rectangles. Brush each rectangle with melted butter. Crease rectangles slightly off center with dull edge of knife and fold at crease. 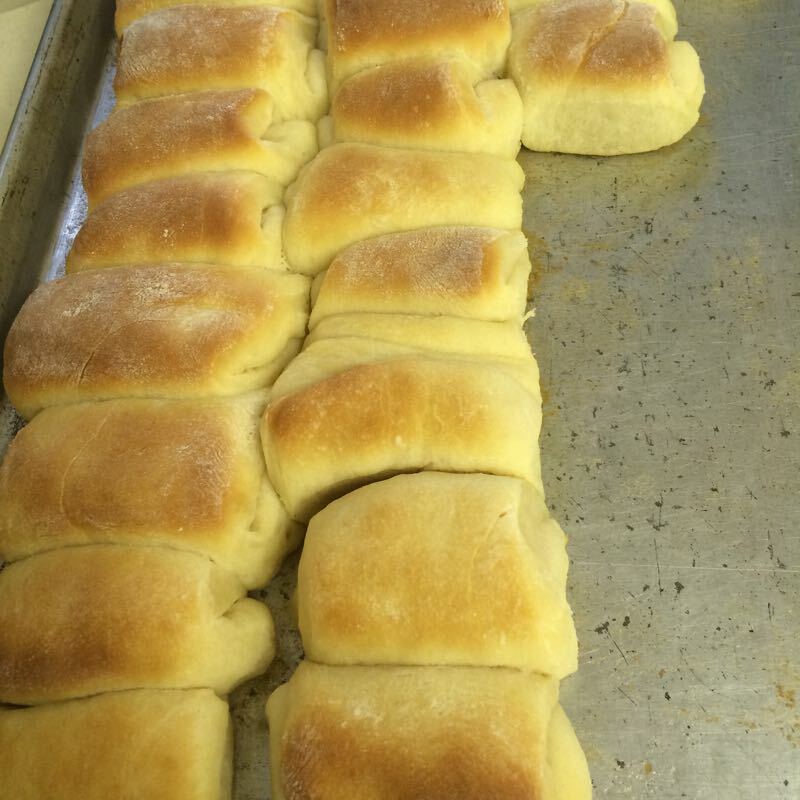 Arrange in rows, slightly overlapping, on greased baking sheets, with shorter side of each roll facing down. Allow 1/4-inch of space between each row. Cover; let rise in warm, draft-free place until doubled in size, about 30-45 minutes. Take the time to let them get nicely risen. Bake in preheated 400°F oven for 13 to 15 minutes or until done. Remove from sheets; cool on wire rack. Brush with more melted butter, if desired. NOTE: I do not like the RapidRise yeast, as I feel the breads go too stale when using that (must be the conditioners they have in there, or something). Regular yeast is what I used, but made sure to allow a bit more time for the rising. 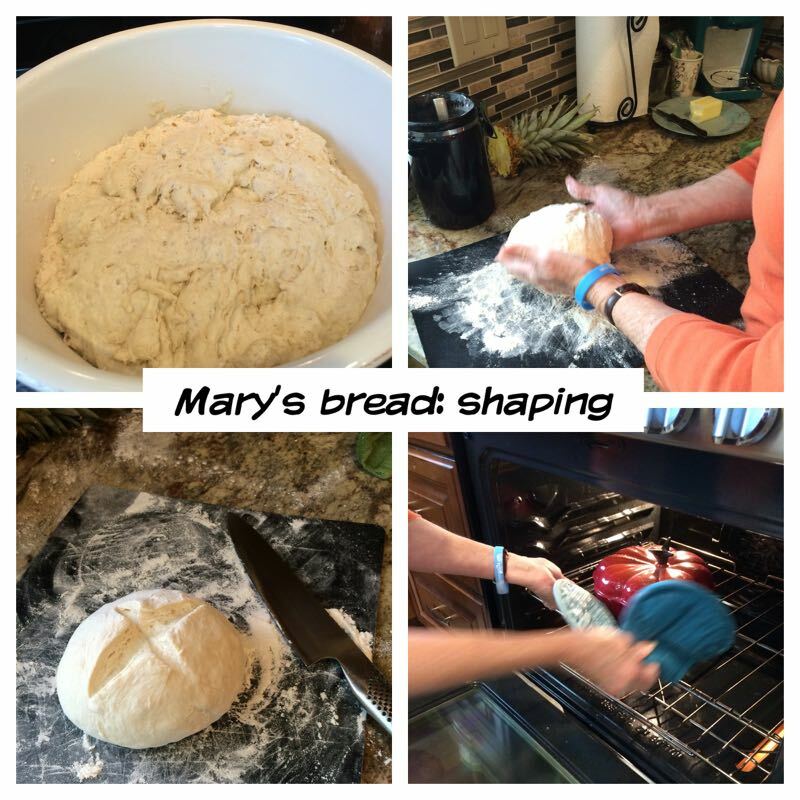 At our recent Beachside Quilting Retreat, Mary — our hostess — brought a loaf of bread to serve us that first night and we all raved over it, asking her lots of questions, jotting down the recipe. 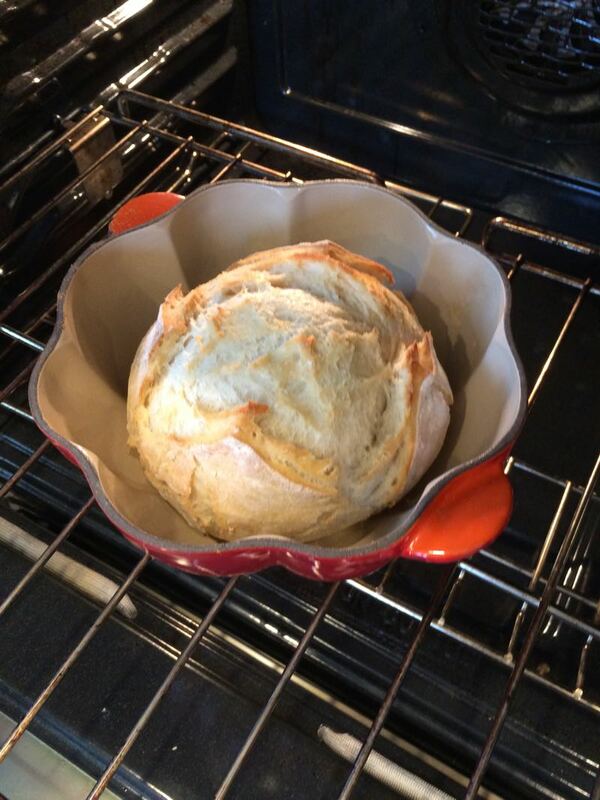 Two days later, when we went to Summerland’s antique store, where we found two pumpkin-shaped Le Creuset pots: I bought one and she bought the other, and that afternoon, we had a bread-making lesson in between all the sewing and quilting. 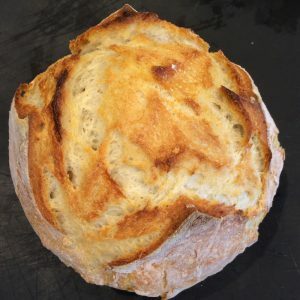 While the ingredients are simple and easily whipped into a ragged-looking dough, it’s her cooking method that sets this bread apart. 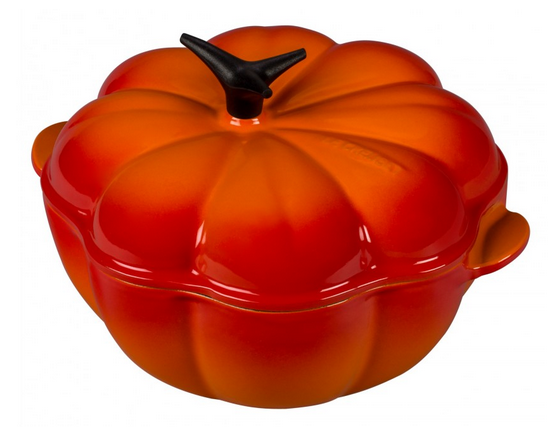 The heavy enameled cast-iron pot is set into a cold oven, which is then preheated for a long period of time. This is what she calls the “brick-oven” method of baking as heat and moisture surrounds the baking dough, ensuring a nice crust. This recipe makes three loaves. Measure out 3 cups lukewarm water. Add 1 and 1/2 T. yeast (2 packages of regular yeast) and 1 T. kosher salt (table salt is okay); let it sit for a few minutes to “bloom.” Stir in 32 oz. flour, roughly 6 to 7 cups. Stir with big spoon and cover with plastic wrap, letting it rise in a corner of the kitchen. While it will rise for a total of 2 hours, after it’s risen for roughly 1 hour set the cast iron pot with its lid into a cold oven and preheat the oven for 45 minutes to a temperature of 475 degrees F.
When the dough has risen for two hours, divide into thirds by grabbing about one-third of the dough. Mary says it’s ragged looking, but keep going. Using lots of flour that’s been spread onto either a pastry cloth or a cutting board, shape it into a ball. 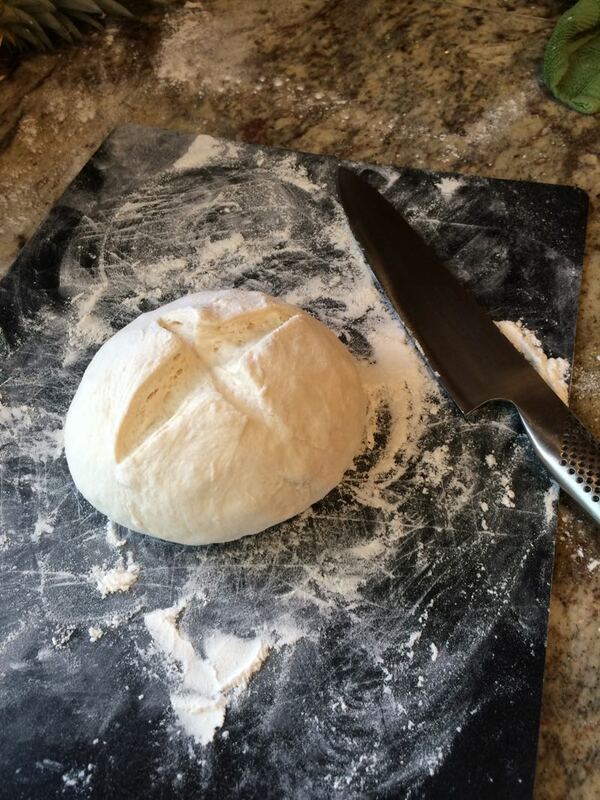 Cut an “X” into the top of the dough using a sharp knife or razor blade. 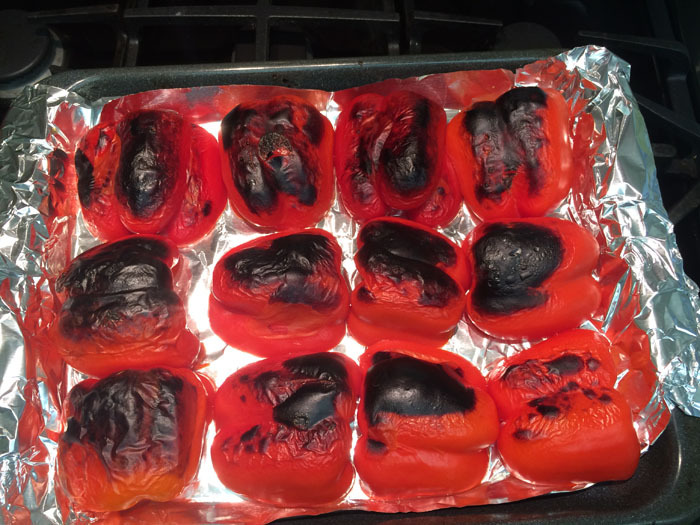 Set ball into hot pan, being careful not to burn yourself. 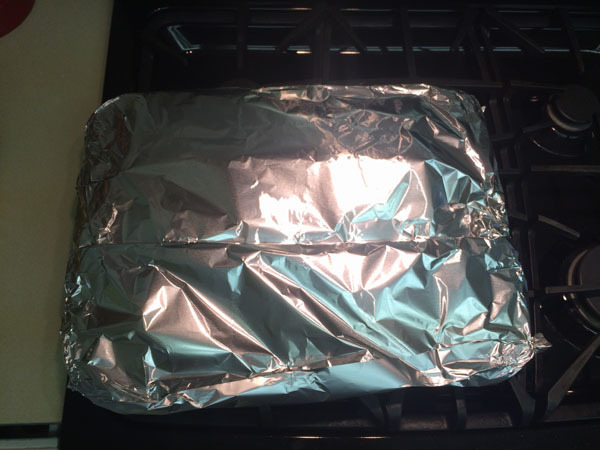 Cover with the preheated lid and cook for 20 minutes. Uncover, and cook for 10 more minutes or until it is a nice golden brown. Either tip out the bread — or grab from the pot — onto a counter and/or rack; let cool. On the second and third loaf (since the dough has been in the fridge), put the dough out onto the floured surface to come to room temp while the oven heats up. Mary says she has left the dough in the fridge for as long as 12 days. 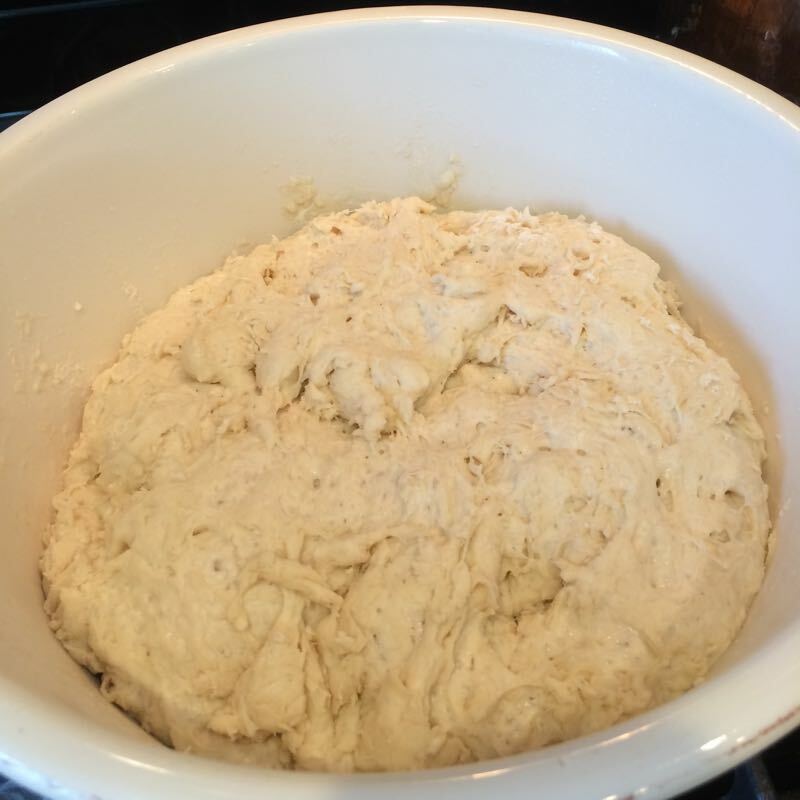 The only noticeable effect has been that the dough gets more sour-tasting. 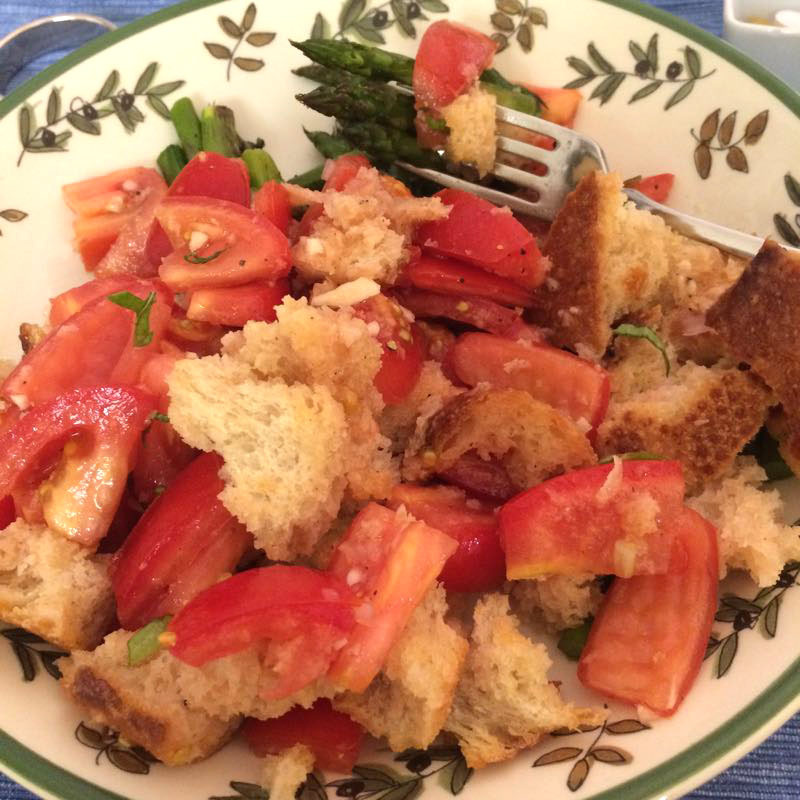 I’ve made all types of panzanella, but I think this recipe is really fabulous. I was traveling in Scandinavia, where the travel author Rick Steves says their favorite vegetable is a potato, and began thinking of my garden back home, wondering how many tomatoes would be ready to pick when I returned. In scanning the news one morning, The Washington Post published this recipe and I couldn’t wait to try it. So the first thing I did when we climbed out of our car after our long trip was to check the garden for tomatoes. But to my horror, the irrigation systems had been shut off while we gone, and my garden experienced the full force of 100+ degree temperatures: it was crispy and no tomatoes. So I used some high-quality tomatoes from Costco for this dish and it was still good. I can only imagine what it would have been with my own. I purchased a sour dough loaf from Trader Joe’s for the bread, cutting off nearly half of to keep to the 8-ounce requirement. Recipe adapted from recipes by chef-restaurateur Fabio Trabocchi of Fiola, and from J. Kenji Lopez-Alt, culinary director of SeriousEats.com. Arrange the bread pieces on a rimmed baking sheet, then drizzle half of the oil over them and toss to coat. Bake for 15 minutes, until the bread is dried and fragrant but not browned. Let cool. Add the garlic, shallot and vinegar to those juices, then gradually whisk in the remaining 2 tablespoons of oil to form an emulsified vinaigrette. 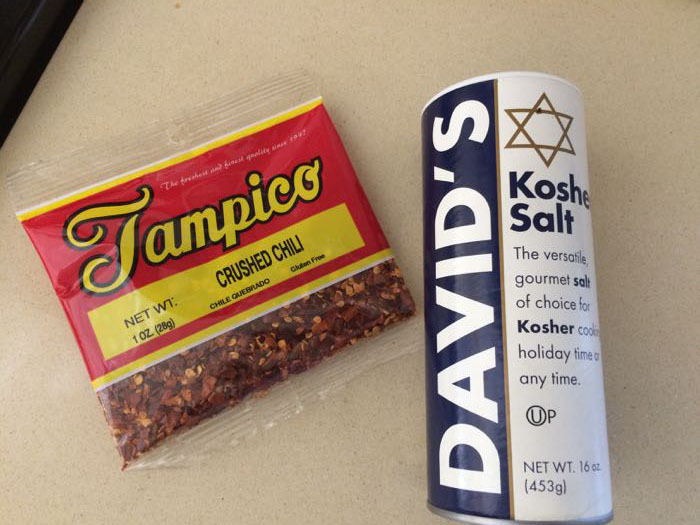 Season lightly with salt and pepper. 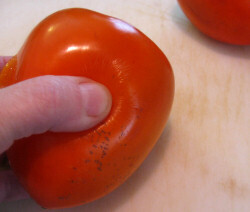 Pour over the tomato-bread mixture; use your clean hands to gently toss and coat. Scatter the basil over the salad; serve right away. This dish came about because we had too much zucchini in our garden. Well — instead of too much — a bounteous harvest of zucchini. I found this recipe on the New York Times website, and followed it pretty much to the letter. Wash several zucchini from the garden; pat dry. 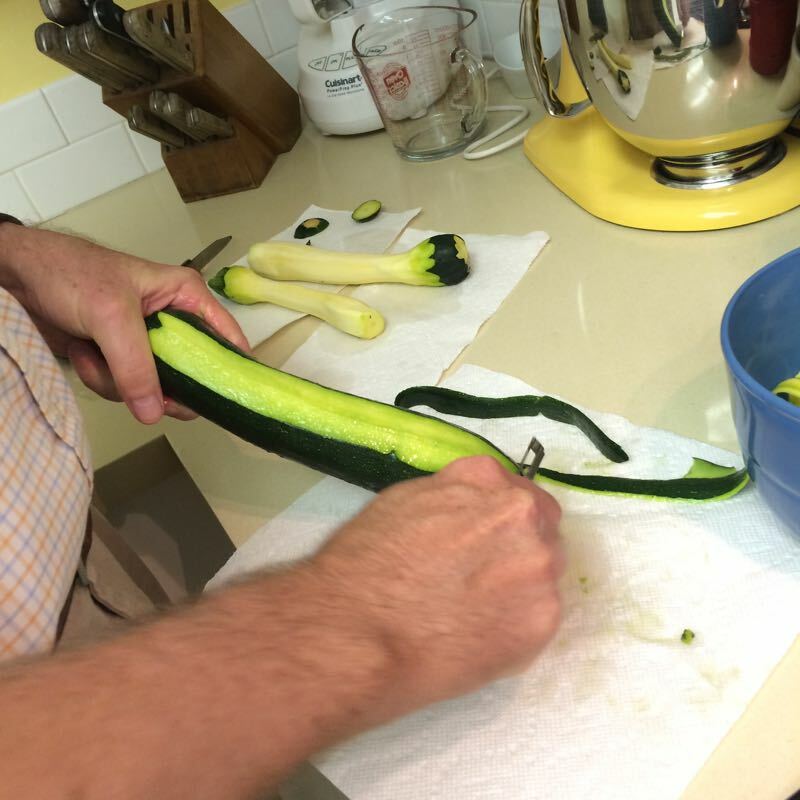 Slice off lengthwise ribbons of zucchini, using a vegetable peeler. Peel off several ribbons from one side, then turn the zucchini and peel off more ribbons. Continue to turn and peel off ribbons until you get to the seeds at the core of the zucchini. Discard the core. You can also do this on a mandolin, adjusted to a very thin slice. 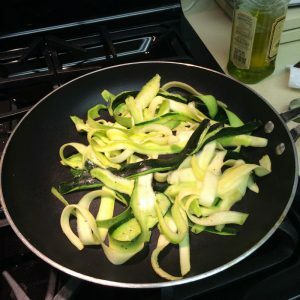 Heat 1 Tablespoon of the oil in a large non-stick pan, over medium-high heat, and when it is hot, add about half of the zucchini ribbons, salt and pepper. Toss and cook, keeping the zucchini in motion until it is just soft and barely transluscent, but not browned (about 2-3 minutes). Set aside, and cook the second batch. 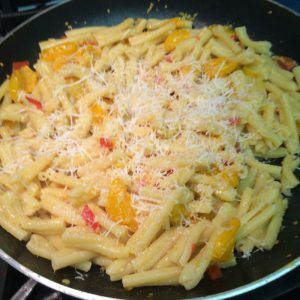 Put both batches back in the pan, and pour over a little bit of cream, then add the grated cheese, again tossing lightly over medium heat. 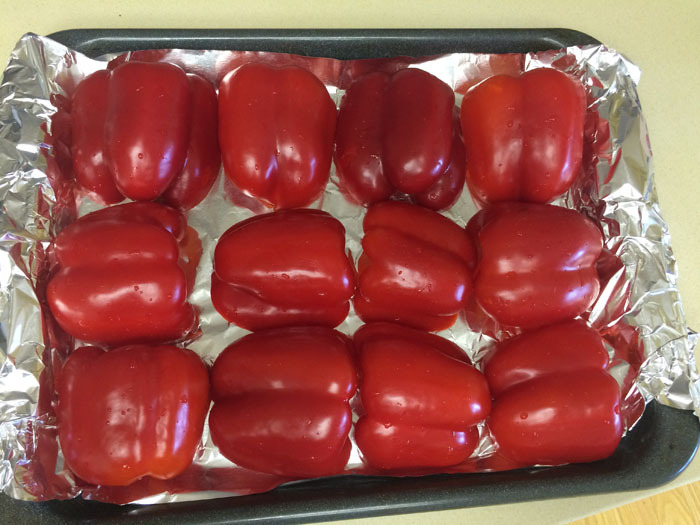 Adjust salt and add freshly ground pepper to taste, and transfer to a serving dish.We topped ours with a fresh bruschetta-type tomato sauce.